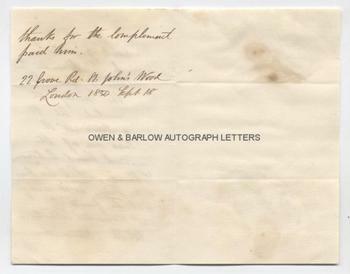 URBAIN LE VERRIER & JOHN RUSSELL HIND Autograph Letter & Envelope Signed. Urbain Le Verrier. French astronomer and discoverer of Neptune. John Russell Hind. British astronomer and discoverer of asteroids. AL. 2pp. 22 Grove Road, St John's Wood, London. September 18th 1850. To W. Hammond. TOGETHER WITH Hind's autograph signature on separate sheet TOGETHER WITH Autograph Envelope, signed by Le Verrier. 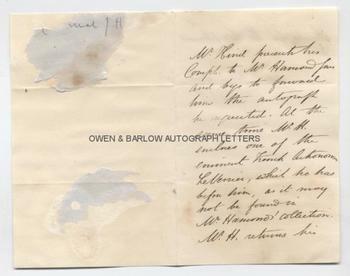 "Mr Hind presents his compl[ement]s to Mr Hammond Jun. and begs to forward him the autograph he requested. At the same time M. H. encloses one of the eminent French astronomer Le Verrier, which he has before him, as it may not be found in Mr. Hammond's collection. Mr H. returns his thanks for the complement paid him." The AL measures approx. 5.5 x 3.5 inches, slight browning, else near fine. 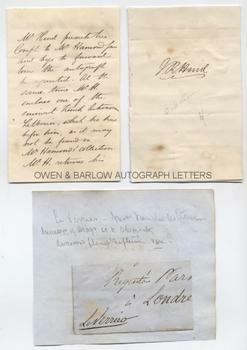 The single sheet bearing the autograph signature of John Russell Hind measures approx. 5.5 x 3.5 inches, a few foxing spots and laid down on paper from old album leaf. 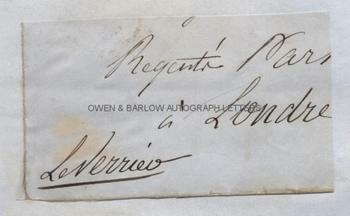 The envelope bearing the autograph signature of Urbain Le Verrier is partially trimmed with some loss of the address and is laid down on paper from an old album leaf. A nice association. John Russell Hind was a Fellow of the Royal Society and President of the Royal Astronomical Society. In addition to being one of the early discoverers of asteroids, two comets and a crater on the Moon are named after him. Urbain Le Verrier predicted the existence of the planet Neptune using only mathematical calculations based on observations of Uranus.